Life is soft. If we want our robots to become more lifelike, or if we want to start using them for more biological applications, they too have to be soft and flexible. That includes robots designed to move around in fluids, robots designed to augment organs in the human body, prosthetics, and, uh, this. Scientists studying soft robotics are trying to overcome some of the inadequacies of moving metal beings made from janky, clanky parts, which might not be so useful for squeezing into tight spaces or moving around in the human body. But switching to bendier materials comes with its own set of problems to solve—for instance, how best to control soft robots, or make them strong enough to lift things. A team of scientists at North Carolina State University is working on new ways to remotely-control soft robot parts, by embedding microscopic iron particles into polymer sheets. They’ve tested their prototypes out, and have come up with a new standard to measure just how well these robo-limbs are performing. The researchers had previously tried making remotely-controlled soft robot parts using lab-made magnetic nanoparticles, but later switched to commercially-available ones. Along with an undergraduate’s help, “that let us do much faster device fabrications,” said Joe Tracy, author of a new paper published this week in the journal ACS Applied Materials & Interfaces. 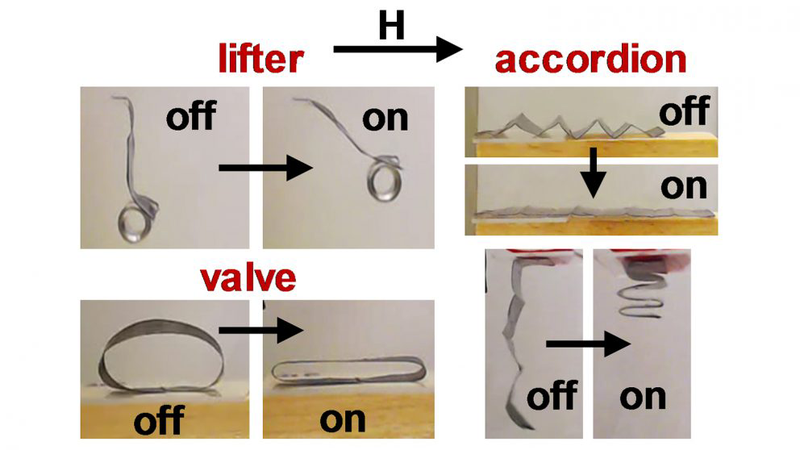 To manufacture these magnetically-controllable robo-parts, the researchers started with a liquid polymer, loading it with four-micrometer (the width of a human hair is 30 to 100 micrometers) iron microparticles. They allowed the stuff to cool into films, which they then cut into strips. Turning on a magnetic field causes the particles to arrange into chains, which alter the material’s shape, allowing for complex functions. The team created accordions that folded, tubes that squeezed, and cantilevers that could lift loads fifty times their weight—all by switching on a magnetic field. Tracy was especially excited about the new metric they’d come up with to measure how strong their new materials are—“specific torque.” This measurement calculates the torque, or rotational force, per unit mass of microparticles, per unit of magnetic field. By comparing the specific torque between differently-shaped robot parts, the researchers can determine how strong each one is, and how they perform compared with other models. Right now, they’ve essentially got strong magnet-powered plastic strips, so if you have any thoughts for functionality for these parts, Tracy is all ears—maybe they can find a use in that weird worm thing. “We need more ideas for what we can do with it,” he said.